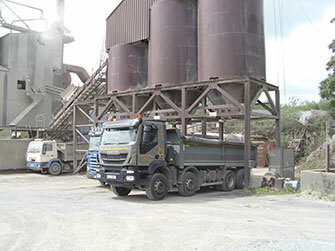 Tullyraine Quarries Ltd have over 50 years’ experience within the surfacing industry manufacture a full range of base, binder and surface course bitmac and asphalts and SMAs to a range of varying specifications. 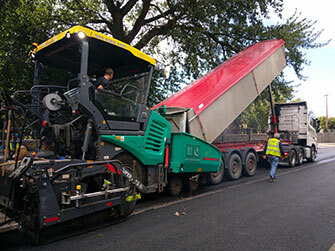 Hot Rolled Asphalt (HRA) is generally used for surfacing applications such as, carriageways, footways, domestic and commercial driveways. HRA is produced using coarse aggregates, fine aggregates which in most cases are sand and a filler bounded by a bituminous binder. When applying a HRA surface course various coloured chippings can be applied to provide skid resistance for commercial applications and a cosmetic for domestic applications. Generally chippings are either black or red but other colours are available. Asphalt concrete has the same composition as HRA but there is no filler and reduced quantities of binder are used. With this type of material, chippings cannot be applied like they can with HRA. Asphalt concretes can be installed and used for the same applications as HRA. Stone mastic asphalt (SMA) is a relatively new product used within in the surfacing industry and is produced similarly to asphalt concrete with the introduction of fibres. The addition of the fibres to the mixing process adds strength, durability and a reduction in surface noise level.